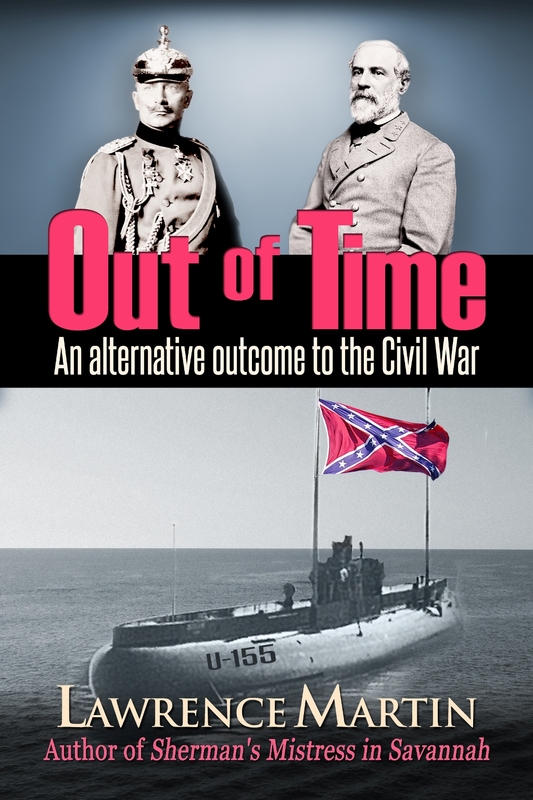 Two Kindle e-novels on the Civil War by Lawrence Martin: Sherman's Mistress in Savannah and Out of Time: An Alternative Outcome to the Civil War. Click on covers for links to Amazon Kindle. 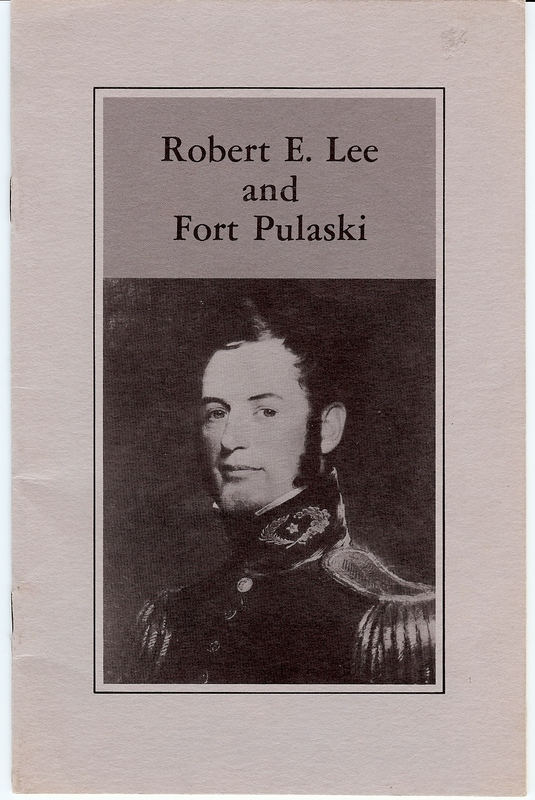 INTRODUCTION: The Battle of Fort Pulaski took place April 10 & 11, 1862 on coastal islands about 12 miles east of Savannah, Ga. The fort, located on Cockspur Island, was occupied by Confederates at the time. 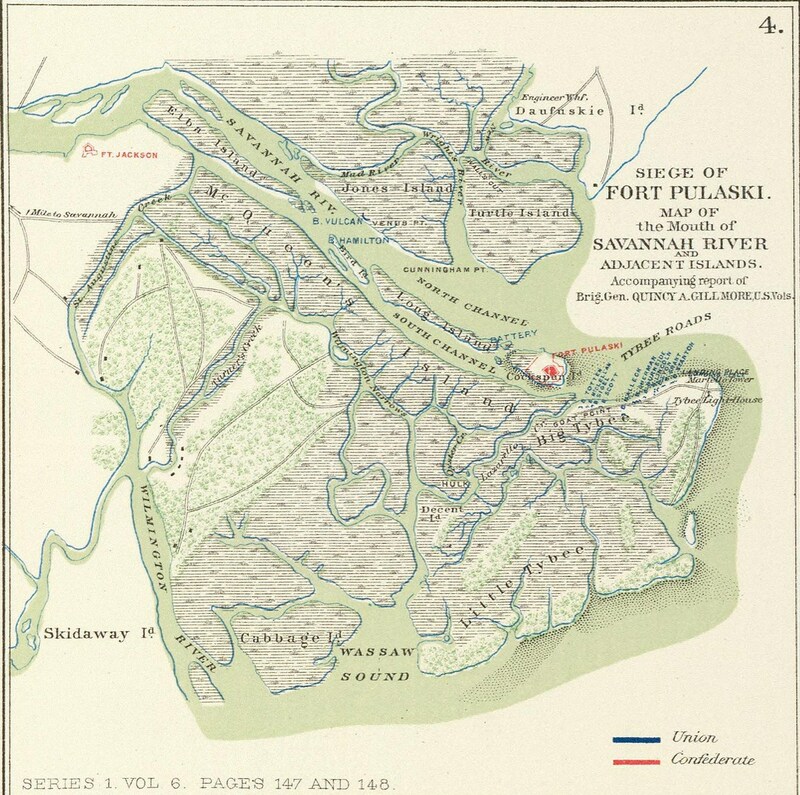 The attacking Union forces, mainly located on nearby Big Tybee Island, took over the fort after less than two days of bombardment. Though short and with relatively few casualties, the battle was highly consequential. The Union victory showed that all masonry forts were henceforth obsolete against the new rifle guns, and it effectively cut off Savannah as a port for the duration of the civil war. The photo above shows the fort as it is today, with holes in the walls from the 1862 bombardment. What follows is a detailed time line of the battle, using both internet and primary sources. After the War of 1812 President Madison decides a series of coastal forts is needed to prevent invasion of the U.S. He commissions a European to design what will be known as the 3rd System of Forts. Fort Pulaski, on Cockspur Island at the mouth of the Savannah River, is one of these forts. Below is an 1860s map of the region, showing the fort on Cockspur Island. 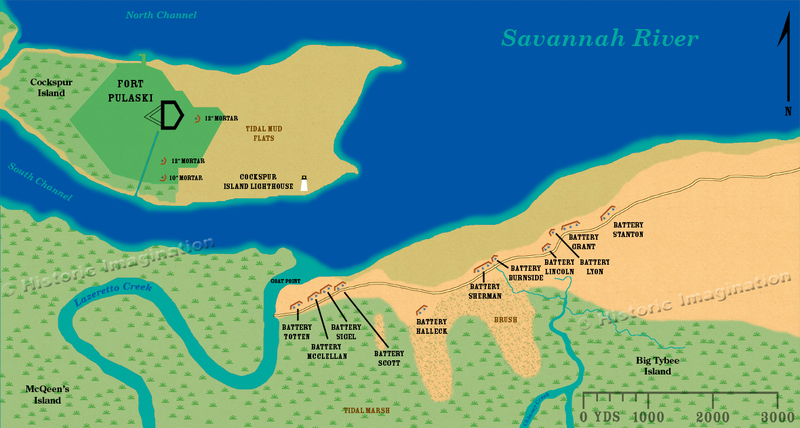 Savannah (not shown on this map) is just to the left of Fort Jackson, about 12 miles upriver from Fort Pulaski. December, 1828 - Preliminary surveys on design of the fort are begun by Army Engineer Major Samuel Babcock (West Point Class of 1808). 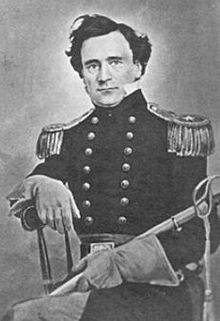 August 11, 1829 - Robert E. Lee (above), a new West Point Graduate (2nd in his 1829 class) receives orders to report to Cockspur Island, Georgia in November; there, he will be assigned as assistant engineer to Major Babcock, to help lay groundwork for the new fort. Early November, 1829 - Lee arrives in Savannah. 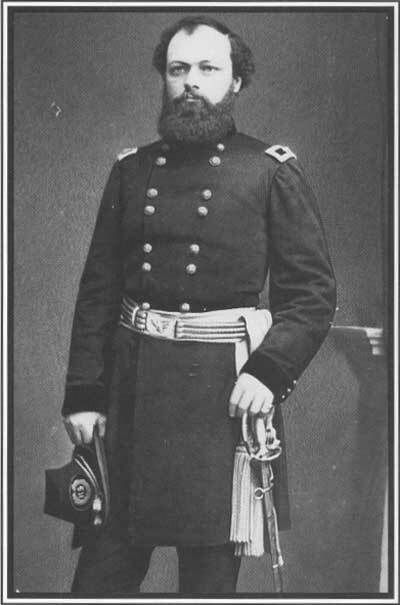 Major Babcock has been up north since the summer months, and so Lee spends time with friends in the city. December 23, 1829 - Major Babcock arrives in Savannah and Lee meets him for first time. January-May, 1830 - Lee and Babcock work on drainage ditches, a wharf for ships to dock on Cockspur Island and barracks for the workers. However, Babcock is ill for much of this period and most of the responsibility falls on Lee. (Babcock left the fort that summer, never to return. He died in 1831.) 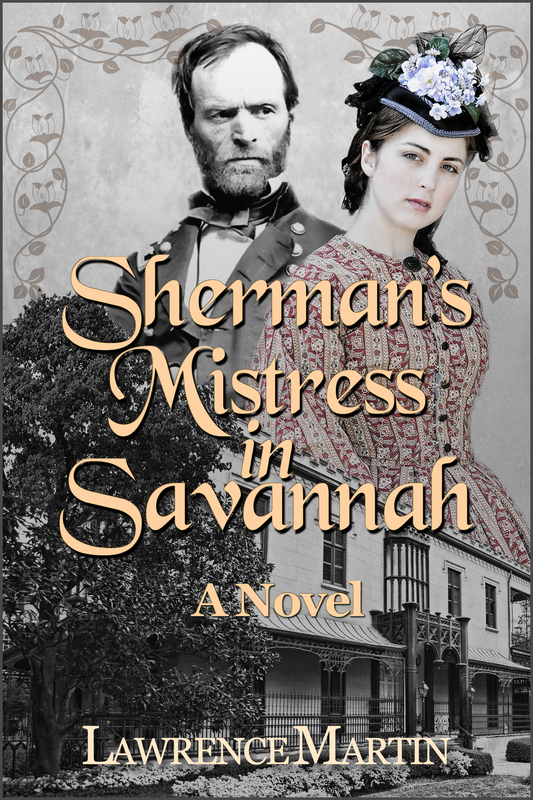 Lee leaves Savannah during the summer and returns to his native Virginia. November 10, 1830 - Lee returns to Savannah, to resume work on the fort. 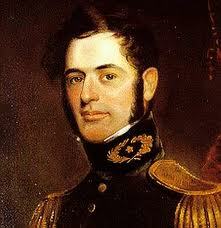 January, 1831 - Army engineer Joseph K. Mansfield (1803 - 1862) arrives to oversee fort construction. January - April, 1831. Lee undertakes detailed survey of Cockspur island, covering all the terrain. He is then reassigned to Hampton Roads, VA. He will not return until 1861. The fort is constructed during a 15-year period, under the capable surpervision of Major Mansfield. During construction it is named for Casimir Pulaski. 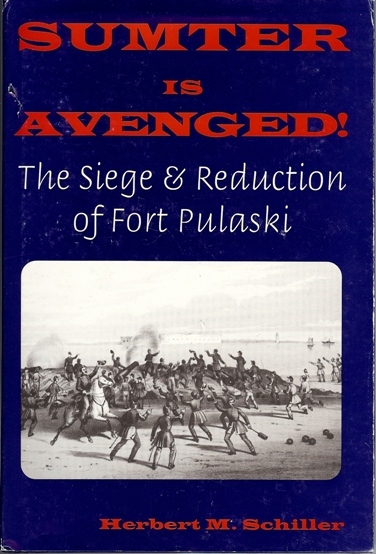 Pulaski (above) was a Polish cavalry officer who died from injury received while fighting for the American Revolution (see Siege of Savannah). 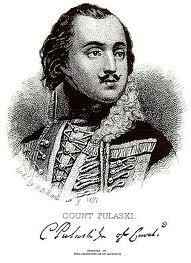 Pulaski was wounded October 9, 1779 and died two days later. Guns are installed but no troops are assigned to the fort. Maintenance of the fort is largely abandoned during this period. Only a caretaker and ordinance officer are assigned during these years. November, 6. 1860 - Abraham Lincoln is elected 16th U.S. president, precipitating South Carolina to secede from the Union. 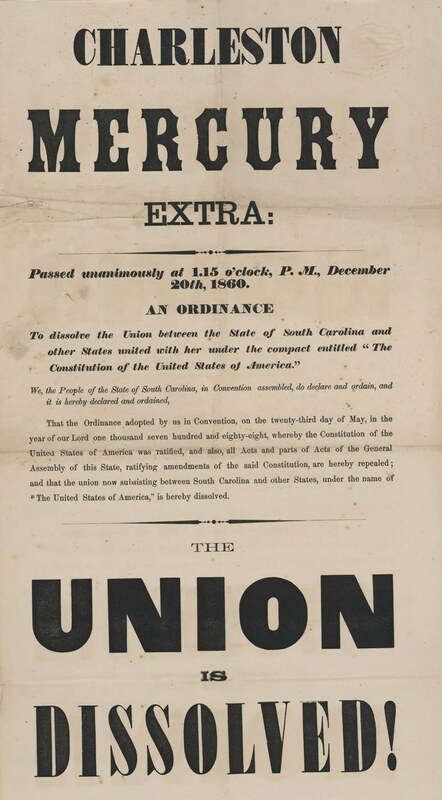 December 20, 1860 - South Carolina secedes from the Union. Announcement is from Charleston Mercury, 1860 (click on poster for larger image). November 25, 1861 - The first United States Flag raised in Confederate Georgia is hoisted atop the Tybee light house. 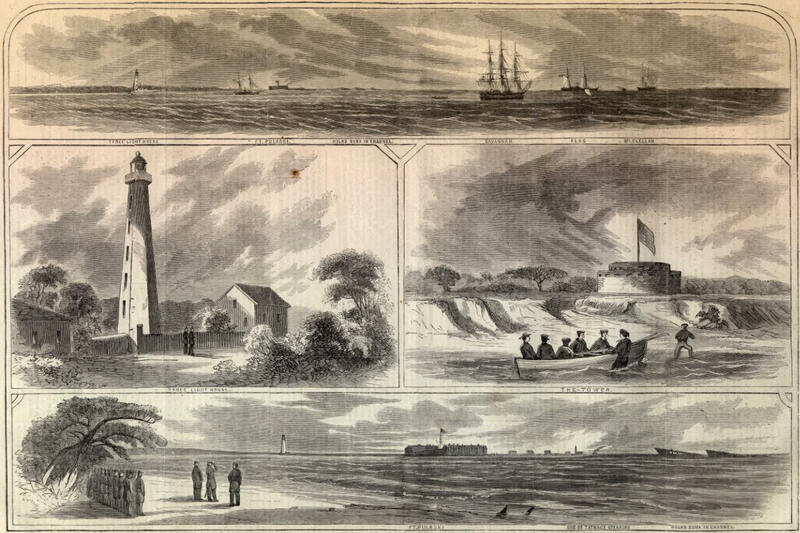 December 14, 1861 - Harper's Weekly publishes drawings of Tybee island, shown below. From top, going clockwise: Tybee lighthouse on Tybee island and Fort Pulaski in distance, on Cockspur Island; the Martello Tower on the northeast corner of Tybee Island (built during War of 1812); soldiers on north end of Tybee Island, with Fort Pulaski in background; Tybee Lighthouse and caretaker's cottage. January - February, 1862 - Confederates provision the fort for 6 months. Because of Lee's assessment, they believe the fort is impregnable to canon fire from Big Tybee, and that the only way the Union can take it over is to starve the soldiers. The Ida escapes injury and makes it to Fort Pulaski, Ida then returns to Savannah via the South Channel and Tybee Creek, avoiding the federal cannon. Subsequently the creek is blockand and a firing platform opposite Venus Point cuts the fort off from Savannah. Communication is no longer by boat, but by a messanger who walks the shore and swims the channels at night. April 8, 1862 - By now Union preparations are complete on Big Tybee Island. They consist of 11 Batteries, each with 1 or more large guns, listed below with their distance from Fort Pulaski (list is from the book Sumter is Avenged! ; see sidebar). Their placement is shown in the map of north Tybee Island. The batteries are named by Gillmore for "the persons most prominent or most likely to be so, in political or military service." Included in the batteries are the new rifle canon never before used by the American army in battle. These are the 5 30-pounder Parrotts and the James rifles. 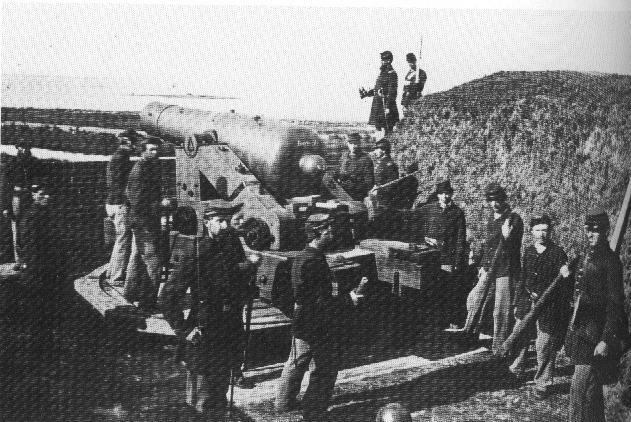 Below is a photo labeled as Battery Burnside, with the gun surrounded by soldiers from the 3rd Rhode Island Heavy Artillery unit. April 9, 1862 - A rainy day, and not a good day for bombardment. The siege's commander, Brigadier-General Quincy Adams Gillmore (photo on right), waits until April 10. "The first shell was fired at a quarter past eight 0'clock, A.M., from battery Halleck. The other mortar batteries opened one after the other, as rapidly in succession as it was found practicable to determine the approximate ranges, by the use of signals. The guns and columbiads soon followed, so that before half-past nine, A.M., all the batteries were in operation..."
April 11, 1862 - Intense firing commences at dawn. By 1:30 pm the fort is breached in one section, so that a cannon ball could go right into the interior and possibly blow up 40,000 lbs. of explosives stored in the fort. Olmstead realizes he can no longer save the fort and decides to surrender. That afternoon Captain Gillmore and his party come to the fort to accept surrender. The officers give up their swords at the time of surrender. Altogether 24 officers and 359 men (non-officers) surrender. (Sumter is Avenged!, by Herbert M. Schiller, White Mane Publishing Co., 1995; see Books About Sherman's March, left sidebar.) 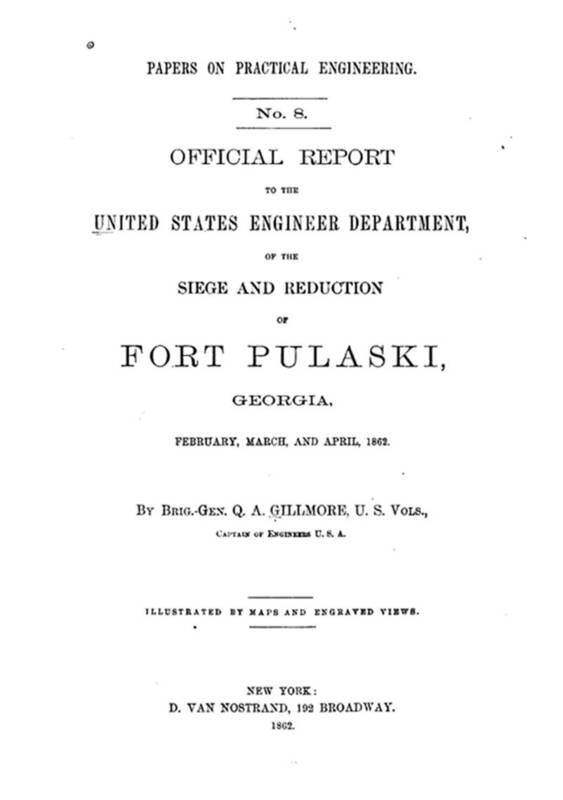 Olmstead later writes: "Fort Pulaski is the first work that has ever been exposed to the fire of the newly invented rifle canon and the result have proved that brick and mortar cannot stand before them." At the time of surrender Fort Pulaski has 373 men, 24 of whom are officers. The officers give up their swords at the time of surrender. General Gillmore's map of the area at the time of bombardment. His blue-colored gun batteries are arrayed opposite the red-colored fort. April 17, 1862 - The first of the Pulaski prisoners begin arriving to Governor's Island, New York. They will move several times before the war ends. June - December, 1862 - By June Union forces have repaired Fort Pulaski and the Union naval blockade of Savannah is near total. Over the next 2 1/2 years - until Union forces capture Savannah December 21, 1864 - it ceases to be a port city. However, the city is well fortified and remains under Confederate control. There are minor skirmishes in the surrounding marshes, and several gunboat attacks on Fort McAllister, but no real military threat to the city until General William Tecumseh Sherman's army marches south from Atlanta, Nov - Dec, 1864. Though Union troops have taken over Fort Pulaski, Savannah remains well defended until Sherman captures it by land in December 1864. Fort Pulaski is now Fort Pulaski National Monument and is open to visitors year round.